The Remembrance Day Contest 2018 has come and gone. This year AREG put it’s club station on the air from a new location thanks to Paul VK5PH and his new hills retreat. Just 20 minutes into the Adelaide Hills, this new location was absolutely RF quiet and had an excellent HF takeoff angle in almost every direction. At 548m ASL, it was only 150m below Mt Lofty (the highest peak in the southern Mt Lofty Ranges). 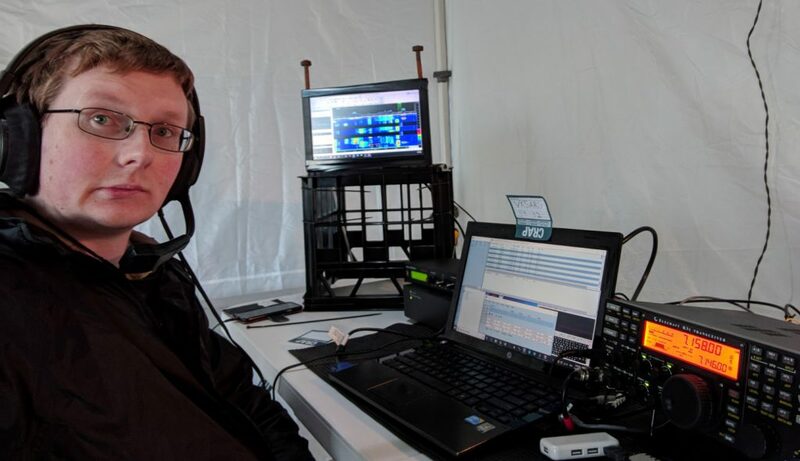 The operation was led by Grant VK5GR who supplied the station, with assistance from Andrew VK5AKH who supplied the main generator and AC power grid. Quite a few AREG club members came up to the site and helped construct the station, as well as Paul, Gerard VK5ZQV and Paris VK5FPAR from AHARS. The core operating team consisted of Theo VK5MTM, Andrew VK5AKH, Grant VK5GR, Mark VK5QI, Chris VK5FR, Matt VK5ZM and Paul VK5PH. Construction assistance was provided by Kym VK5FJ, Dennis VK5FDEN and Irene with catering provided by Sharon VK5FSAW. It was great to see so many members braving the freezing conditions to make their way up the mountain to support the event. Special thanks to Andrew and Mark who also took on towing the rented port-a-loo up to the site. Preparations began the week before when the first antenna was erected and tested. 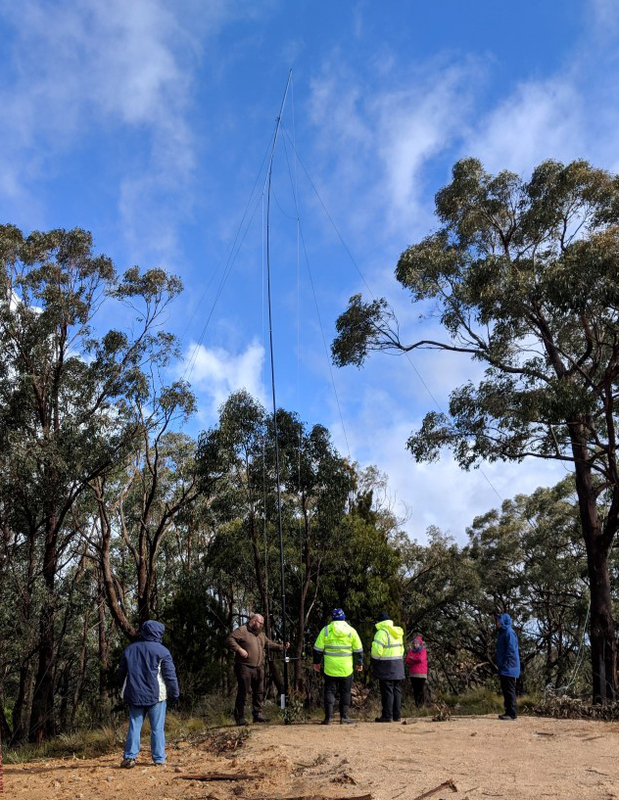 Paul, Gerard, Mark and Grant erected the 80/40m crossed inverted V antenna and tuned it in horrific wind conditions the previous Saturday (with winds gusting at 50-70km/h). That feat achieved meant that the following weekend things would go more smoothly (or so we thought). The Friday night before the event saw Chris VK5FR and Grant VK5GR pack the station trailer ready for a 6.30am departure the next day. A huge thanks to Chris for his help. On Saturday VK5GR, VK5FSAW and their daughter headed out along with VK5QI, VK5FR, VK5MTM, VK5ZQV and VK5PH and arrived on site around 7.30am. The first order of business was to erect the pre-tuned 40/80 dipoles into the air and then build the station. The weather hadn’t improved much over the previous week with conditions still somewhat blustery with rain and biting cold thrown in for good measure. Once 40 and 80m was complete, the team turned their attention to the 160m antenna. This antenna was the same one VK5GR took to Vanuatu earlier in the year (that at the time he was able to put up single handed). This time, with the wind, rain, slush, mud and cold it was a very different prospect with numerous false starts and growing frustration as we raced against the clock and the weather. After about 90 minutes the first attempt was shelved as the weather closed in. The crew retreated inside the main shed to complete the setup of the station and get ready at least for 40/80 at the start of the contest. 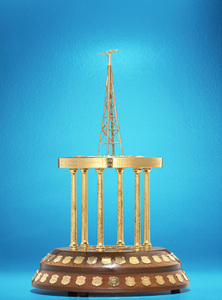 The team planned on returning to the 160m antenna project in the afternoon once the contest was running. By a fortuitous mis-calculation, the team thought it started at 11.30am local and had completed preparations by 11.00am. This was fortunate as then the heavens opened. Down came the hail and sleet, up came the wind and boom went the thunder as antennas were hastily unplugged. It was as though someone didn’t like the teams presence on the hill. The temperature dropped even lower reaching 2 degrees Celsius at midday and the wind chill climbed. The thunder passed by 11.20am so cautiously the antennas were reconnected, only to be met with S7-9 hail static. Finally the worst of the weather passed and things settled down for the expected start at 11.30am. The clock clicked over and VK5ARG started calling CQ – only to see no one else on the band. A hastily recheck of the rules and the mistake was realized. Phew – three was another hour available to further preparations around the site. The final bugs were worked out of the software system and some tidy up completed before finally opening on time at 0300z (12:30pm). By 0500z (2.30pm) the weather cleared enough that a second attempt at 160m was made. It has to be said that if it wasn’t for the calm arrival of Kim VK5FJ, VK5ARG may not have been heard on top band this contest! Finally, however, the inverted L was rasied into the air and tuned successfully. VK5GR was very happy to see it tune up with a 1.4:1 VSWR around 1840kHz with about 40kHz of bandwidth. It later was proved to work extremely well despite the horrible QRN (storm static) that was to descend across the low bands later that night (due to a large thunderstorm in the Tasman sea). Back a the operating table, the station itself consisted of an Electaft K3S Transceiver, with a KPA500 Linear and a KAT500 tuner (needed for the CW section of 80m). The logging and CW keying was provided using N1MM software with a Microham Keyer II. All up a very capable station (with one niggle with a SW fault with the voice keyer on the K3S which is being investigated further). Overall, the bulk of the contacts were made on 160 and 80m at night and 40m during the day, with a small number of VK6 and VK4 stations on 20m. Nothing was seen on 15 or 10m despite repeated spot checks and the odd CQ call. None the less, the tally continued to rise, with a final score of over 530 contacts and 880 points. Most importantly, everyone who came had a lot of fun, despite the cold temperatures and the weather. Finally, a big thank you to everyone from AREG and AHARS who participated and in particular a huge thank you to all of the amateurs across Australia and New Zealand who took part! VK5ARG looks forward to running in the RD Contest yet again in 2019! This entry was posted in Club Activities, Contesting and tagged RD Contest 2018 by VK5GR. Bookmark the permalink.